“Enshu KOBORI” was a well-known designer of architectures and gardens in the beginning of the Edo-era (17th century), such as the Katsura-rikyu (the Emperor’s summer palace) and the Nijyo-jo (the Shogun’s palace), UNESCO World Treasure located in Kyoto. In addition to his famous artworks, he was a brilliant maestro of the tea ceremony, and became the teacher of the Tokugawa-Shogun family. A piece of his artistic heritage, the Hasso-an tea ceremony house, has been moved to Sapporo and then designated as a National Treasure. The family founded the Enshu-ryu tea ceremony party in 17th century, and the “Yamato-Enshu-ryu” is a variant of this style. The basic artistic idea is Kirei-sabi, or simplicity along with the nobility. 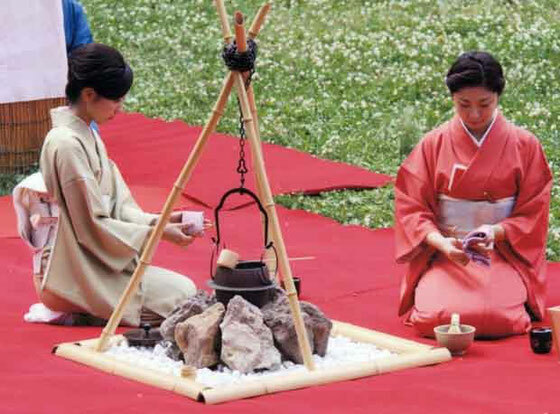 Nowadays, large tea ceremony parties are learned by young ladies as basic Japanese manners. But the Yamato-Enshu-ryu is unique in its Samurai style. In this particular tea ceremony there is a Samurai-style host, as the tea ceremony originally has started out as Samurai formal manners during the middle ages of Japan. The tea ceremony was originally performed in a small cabin, and also it could be performed publically outside of building, where we are enjoying the tea ceremony under natural environment.